VI. A corporate body subscribing not less than £ 50 a year, for a term of years, shall, during that term, have the right to nominate a member of the Managing Committee. Representatives from the Hellenic Society and Oxford University on the Managing Committee were joined by a representative from Cambridge (from 1896/97). Each institution then gave £100 per annum (except for the Hellenic Society and Oxford during the First World War). 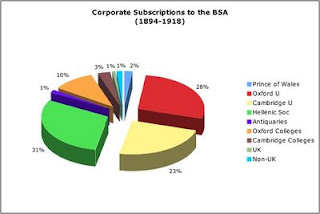 The BSA was regularly supported by a subscription of £5.5.0 from the Society of Antiquaries of London, and £25 from HRH the Prince of Wales (and after he became King). Information and chart revised 7 August 2008.